In May 2017, I had the opportunity (& great good fortune) to fly with the legendary Choppy Patterson & Over the Top Helicopters over an early morning Fiordland. It was an experience I can never forget – an early morning liftoff, full harness (plus seatbelt) open doors, bone-chilling temperatures & an amazing landscape slowly awakening from its overnight slumbers. 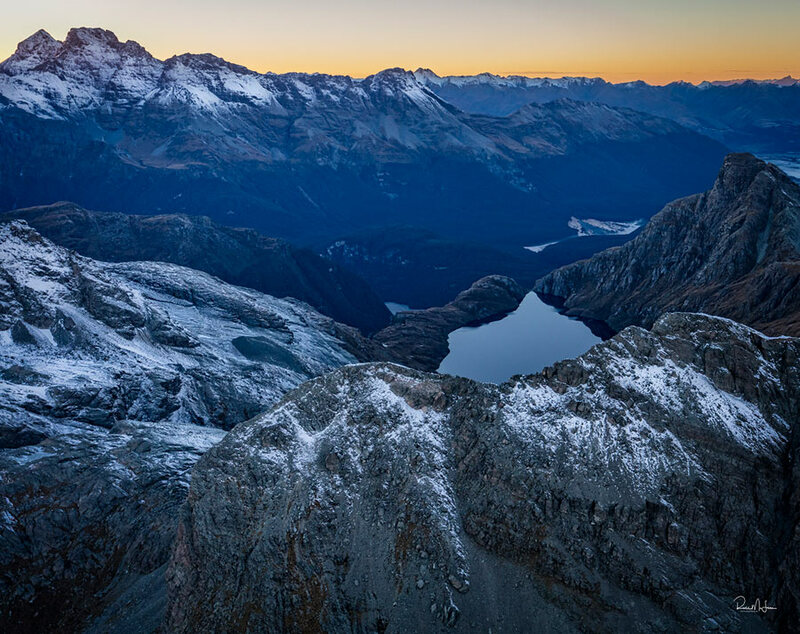 By its very nature, Fiordland is relatively inaccessible & few have had the privilege of getting up close & personal. But we did, buzzing expertly between sun-lit peaks & skimming low over high altitude lakes & valleys. It all made for incredible viewing – the sights came thick & fast & the camera action was very, very busy. Many of the resulting images will never make the public arena, but over a period, a few selects will. Mountain Tarn is the first to be released & very definitely one of my favourites.